Nowhere were water’s damaging effects to works of art more evident than from the unprecedented and costly super-storm, Hurricane Sandy. AXA ART has chosen casualties of this storm for presentation at its lounge during the 2013 AIPAD Show. On display will be damaged photographs, To Fight with Crossed Arms, 2007, ed 4/5, by prolific Chinese contemporary artist, Ai Weiwei. Over its more than 50 years of operation, AXA ART has seen and settled a variety of natural disaster claims, internationally. 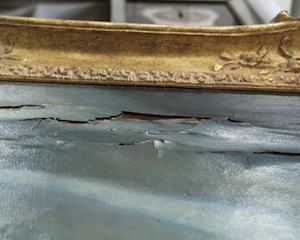 The global art insurance specialist advises that while some accidental damages can neither be foreseen nor deterred, there are practical steps that can be applied to prevent the total destruction of works of art whether on display, in transit or in storage. Key components in the planning strategies of collectors’ and galleries’ should include evacuation and catastrophe preparedness as well as maintaining proper storage for art collections and inventories. “Ultimately our goal is to support collectors as they seek to safeguard the value and longevity of their collections,” Fischer concluded. Reference AXA ART’s Collection Management Series for general information gathered from conservators and worldwide expert partners on caring for collections. For more detailed information on protecting your possessions, AXA ART’s Claims and Risk Management teams are available resources.